Property 6: An attractive holiday home, just outside the town of Piesendorf. Property 7: Modern holiday home is beside Austria's largest ski-area. Property 12: This modern holiday home is beside Austria's largest ski-area. 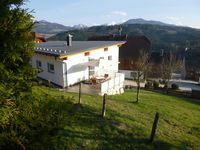 Property 13: Dream of a holiday house with terrace and stunning panorama of the Zillertal.